Get a break room designed for refreshment and style. A fresh new take on offering more food and drinks in your workplace. Nutrient-rich selections are front and center in our well stocked micro-markets. Having a place to refuel and recharge makes employees more productive. Employees feel valued when companies offer great tasting on site food options. Our online system creates specific restocking lists based on purchases. Open shelves and glass coolers allow for a greater number of options. 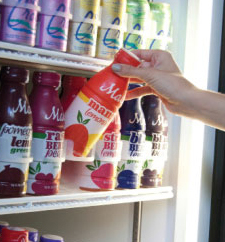 Micro-markets bring sophistication to a company break room with appealing design. Get 24/7 convenience by scanning and paying for options at our secure kiosk. We accommodate companies who wish to pay for products either in full or in part. Employees love being able to grab a quick necessity before they head home. Get more options with less hassle from a micro-market. Discover the break room that will wow employees with a Dependable Vending micro-market at info@dependablevend.com and 800.785.3803 ext. 223.